'King of Georges River', the breastplate left to Albert, caused some confusion when it was found many years later. A small newspaper article surfaced in the Sydney paper in the early part of the 20th century, noting that a breastplate had been found at the Ryde coucil chambers with "Albert, King of Georges River" engraved upon it. The author asked for information about this mysterious 'King Albert'. 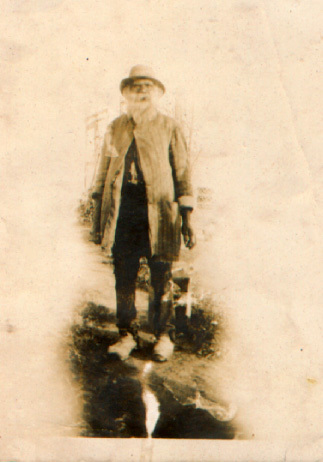 My great grandfather, George Collyer Hicks, landholder in Epping at the time wrote back to the journalist to tell him of Albert Binghi, the farm hand that had lived and died on his property. Georges childern, Joan and Patsy, remember Albert being referred to as "that lazy old bugger" as his life got shorter. Although other memories include being chased about the property for washing their feet in the chickens trough, one of Alberts charge! When Albert died, his possesions passed directly into the hands of the local police. Apart from his clothes and perhaps a few rags the government had spared, his only possesions included the breast plate pictured here and a diamond ring. The diamond ring was never seen again. Although the mystery of the breastplate was confirmed, Alberts story was never recorded and perhaps it will dissapear from all human history. The last of the true aborignal people, integrated into the occupation and colonisation of Australia. Not so long ago now. However, why did that breastplate say "King of Georges River"? Georges River in NSW is a river rich in traditional native history with cave art and other artifacts, including spanish visitation, has been found there. "King of Georges River", however, does not refer to any one governing person, but I believe was the "common" or english reference to the georges river tribe. Dharawal, an aborignal dialect, was spoken south of Botany Bay and west as far as the Georges River and was probably what the tribe spoke.